I know, I know, it’s a bit too early to be talking about the Galaxy S10 right now but this will be interesting for those who like to keep track of processor nodes. We’re assuming here that Samsung’s 2019 Galaxy S flagship will be called the Galaxy S10 but what we certainly don’t have to assume is that it’s going to feature a more powerful chip than the Galaxy S9’s Exynos 9810/Snapdragon 845 duo. According to a report, which when taken into consideration with a recent announcement made by Qualcomm, suggests that the company’s next flagship processor will be a 7nm chip. If that’s accurate, the Galaxy S10 will likely be the first smartphone to feature it. Qualcomm unveiled the Snapdragon X24 yesterday, it’s the company’s new LTE modem for smartphones which promises theoretical download speeds of up to 2Gbps. Qualcomm says that this is the first Category 20 LTE modem with support for such high speeds and it happens to the first LTE modem that has been manufactured on the 7nm FinFET architecture. Since Qualcomm has said that we can expect the first commercial devices with this modem to hit the market by the end of this year, it goes without saying that the X24 won’t debut with the Snapdragon 845, the chip that’s going to power the Galaxy S9 in markets like North America. The Snapdragon 845 has Qualcomm’s Snapdragon X20 LTE modem. 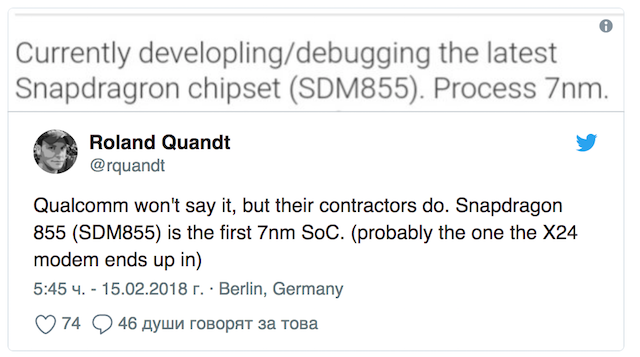 Qualcomm is yet to confirm the process on which its next high-end SoC is going to be built but it appears that the LinkedIn profile of a Qualcomm contractor’s employee has revealed that the “latest Snapdragon chip” is the Snapdragon 855 and that it’s being built on the 7nm FinFET node. Therefore, it is now being speculated that the Snapdragon 855 will be the world’s first SoC to be built on the 7nm FinFET process and may also include the new 7nm LTE modem that the company announced just yesterday. It doesn’t seem out of the realm of possibility when you think about it. Do keep in mind, though, that this is pure speculation based on circumstantial evidence right now so until there’s concrete information to go on, maybe don’t start dreaming about the significant and efficiency gains that a 7nm chip would bring to the Galaxy S10. While Samsung has manufactured Qualcomm’s recent Snapdragon chips on its 10nm process, it was reported last year that Qualcomm has contracted TSMC to manufacture its next-generation high-end chipset on its 7nm process. Samsung’s 7nm process was delayed because the company wanted to focus more on its 10nm process. On the other hand, TSMC skipped the 10nm process and focused entirely on the 7nm process. It supplied 7nm chip development tools to its clients in 2016. Samsung recently revealed that it’s going to provide 8nm and 11nm processes to customers this year and start a risk production of 7-nano. TSMC started risk production on the 7nm process last year. However, some industry analysts believe that Samsung’s 8nm node is actually a “relaxed version” of its 7nm using multiple patterning. This suggests that the company will be able to deliver similar performance with its 8nm that other foundries like TSMC do with their 7nm process. Samsung’s 7nm will then likely be superior to its rivals when it eventually arrives. This will be courtesy of the extreme UV (EUV) lithography technology for making microprocessors that Samsung will use for 7nm compared to the more traditional optical process used by TSMC. It’s because of EUV that Apple is expected to return to Samsung for its 7nm A12 processors. TSMC has been Apple’s exclusive chip manufacturer since the whole chipgate controversy with Samsung. TSMC skipped 10nm? I thought the A11 was a TSMC 10nm chip. Haha adding news to make Samsung potentially exciting? Given the s9 is not really anything to get excited about.